The New Wave of Traditional Heavy Metal (NWOTHM) continues to develop steam in North America with Razor Fist's latest Metal Minds, a tour-de-force of classic thrash heavy metal. Prepare to reinforce your neck and back muscles because, from first track to last, Razor Fist delivers a fast-paced, blistering and head-banging metal onslaught. Yet this inherently leads to a problem. Even with the admirable frenetic pace and heavy metal intensity of Metal Minds, Razor Fist leaves little room for variation. Except for a few songs, most rely on near chaotic thrash arrangements with little melodic development to transport them. Fury of the Warrior, the epic Loud in the Night, Breath of Fire, and the easily forgotten Metal Minds sound like a quadriplegic trying to escape from a wet paper trash bag. They're saved by the bestial intensity of the rhythm section and sometimes the lightning guitar work. Razor Fist does on Cosmic Hearse Driver, First Strike, and the brilliant Thirst for Disaster where the arrangements settle down for a more well-paced complexity. Yet the bigger problem is that Razor Fist may be to easily identifiable with another North American band. Thanks both to their chosen genre and the vocal style of TK Xanax, Razor Fist sounds like a midwest clone of 3 Inches of Blood. Though Xanax is not quite as high pitched or screamo as Cam Pipes, after about three to four songs, his consistent predictability and lack of variation becomes monotonous and annoying. Wisconsin's Razor Fist eloquently and expertly reinvents classic thrash heavy metal for modern times with Metal Minds. Unfortunately, however, their musical approach is already being done as Razor Fist sounds suspiciously like 3 Inches of Blood. However, if you miss the glory days of true thrash or speed heavy metal, Razor Fist is a definite buy. 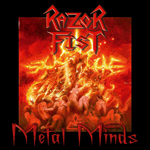 Wisconsin's Razor Fist eloquently and expertly reinvents classic thrash heavy metal for modern times with Metal Minds. Unfortunately, however, their musical approach is already being done as Razor Fist sounds suspiciously like 3 Inches of Blood.